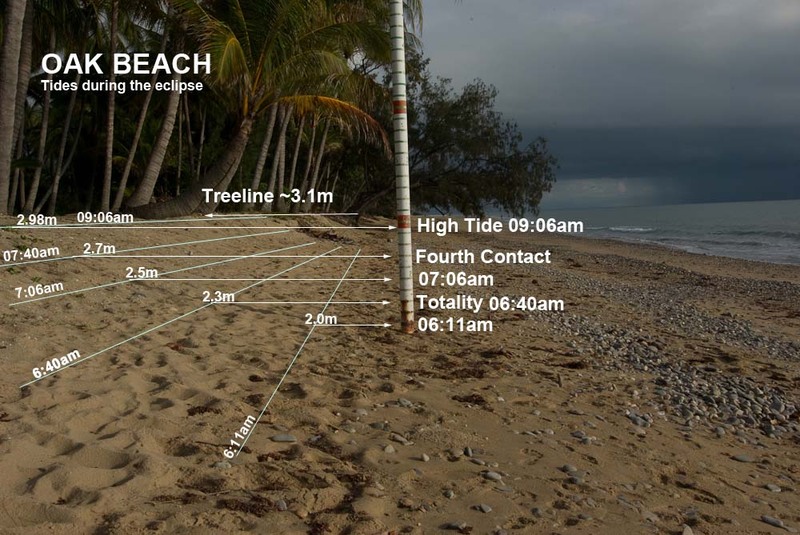 Any place with a good view of the east horizon will make a great place to watch the November 14th, 2012 Cairns Port Douglas total solar eclipse. Though the beach immediately comes to mind, the tide will be coming in as the eclipse progresses. Some beaches may become covered by tides . New Moon and totality occurs at 06:38. A high tide of about 3m occurs mid-morning (9:06am) on the day of the eclipse in this region. Tide height during totality will probably be about 2.3m. So the tide will be low at 2:30am and still low about the time you select your observing location pre-dawn. The tide will be coming in during the eclipse and high tide will occur about an hour after the total eclipse ends. Oak beach might seem to be the perfect spot located on the beach and the centre line but the following photographs show why Oak Beach should be avoided. 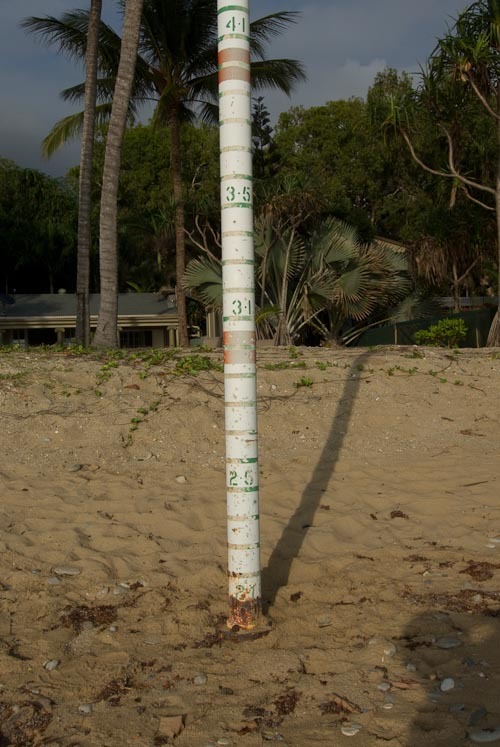 The tide pole base is 2m. As best I could determine, treeline is about 3.1m AMSL. Four Mile beach is a very flat beach. High tide regularly reaches the debris line level with the piece of driftwod in this photo and by 9am on eclipse day may well be lapping at the trees. The marathon starts from the south end of the beach and then contestants run up the beach at the end of the race not at the beginning. 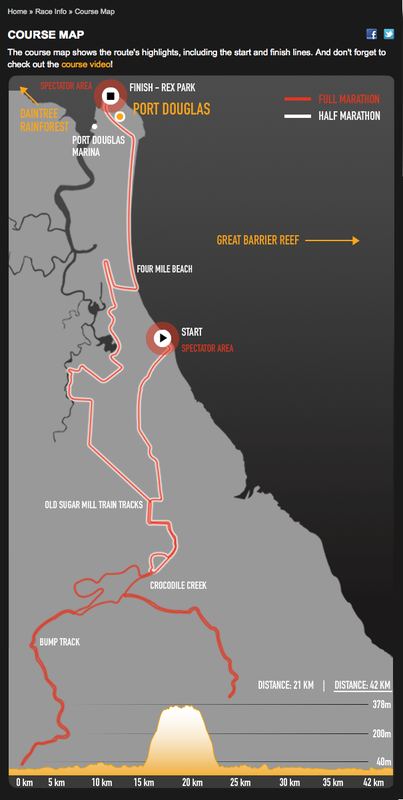 At around 4th contact, the half marathon entrants will be running up the beach. One and a bit hours after this the first of the full marathon runners will be coming up the beach. The half marathon runners might be running up the beach around 4th contact but they'll be spread out and effectively running single file. Most eclipse chasers will be packing up or gone by then. People doing long time lapse sequences might find that runners on the beach makes for an interesting and different foreground to the cliche palm trees. At the beginning, they will be milling around at the start area at the south end of the beach. I don't know if they'll walk or jog down the beach to get there. The marathon organizers seem to have attempted to minimize road closures and disruptions as much as possible. The marathon only crosses the Captain Cook highway once at the start and again once at the finish. Most of the marathon is run on farm and bush tracks not on public roads to minimize disruption. The half marathon runners might be crossing that road and running up the beach at 4th contact but not much before. Most likely, they'll have marshalls at the road crossings who will briefly close the roads, only while competitors cross, then reopen them. The Captain Cook Highway is the only transport route along the coast. I have read where some have suggested they might close it for a day. This is a nonsense suggestion. Common sense dictates that even an hour closure would cause a major disruption. They won't close it, if for no other reason than the inconvenience it would cause and the economic cost to the locals who cast their votes for the council. Local tour companies will still be running tours to Daintree, Mossman Gorge, Port Douglas supermarkets, shops, restaurants and hotels still need fresh food deliveries and reef cruises will still be sailing out of Port Douglas every day of the week. That road is essential to their business. Life doesn't stop because of a marathon or an eclipse. "And it remains to be seen whether viewing would even be able to be allowed from four mile beach, as the entire stretch is on the route." In my opinion, you wouldn't necessarily want to watch the eclipse from Four Mile Beach. Because of the rising tides, you'll have to locate yourself at the treeline resulting in a poor view of the approaching shadow. The high tide will creep up quicker than convenient during the eclipse. I had a poke around some online tidal models. They seemed to spit out a tide height estimate at totality of about 2.3m. This will cover most of Four Mile Beach and Oak beach at totality. The incoming tide will, by 4th contact, cover most of the sand area of the beach leaving only a narrow strip for pedestrians. Here is an extract of the data. EST is Australian EST not USA. The full raw uncorrected data set from midnight-10am on eclipse day is pasted at the bottom of this file. Starting with the world map I zoomed in and selected Port Douglas. 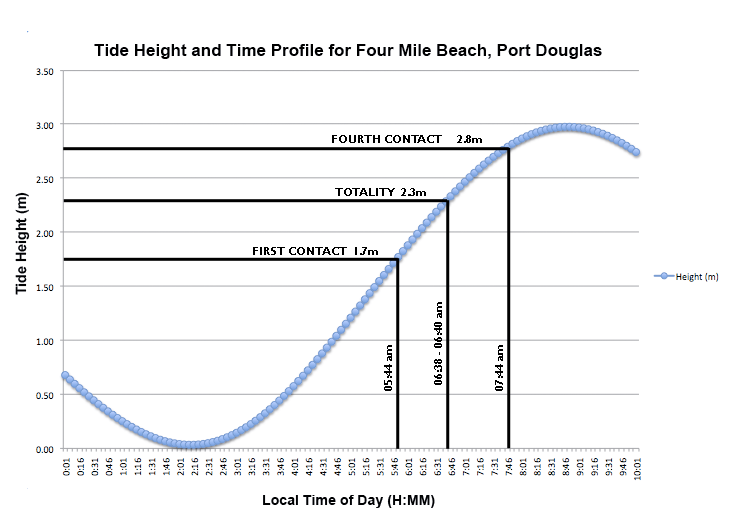 The online tool allows you to generate a time interval height profile. I generated this for 5 minute intervals from midnight EST on the 14th. The data did not agree with the BOM data. It was out by about 10cm in high and low tide predictions and about 10 mins in time. I trust the BOM more and the tbone site contains a disclaimer warning that the data isn't guaranteed for accuracy. I used the profile generated by the tbone site but renormalized the data to fit the BOM height predictions. I didn't correct the 10 min time differences. For the purposes of eclipse observation planning, they are insignificant. Generating a set of heights is all very well but unless you can translate this to some sort of physical reality, it is of little use. 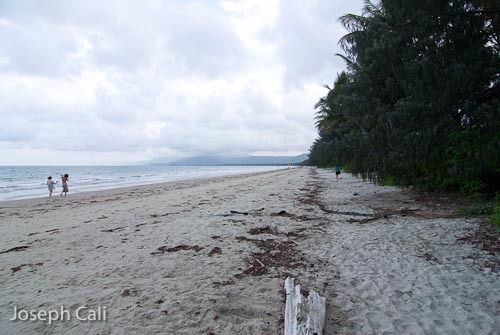 Along the Cairns -Port Douglas coast there are many beaches. Each beach has its own physical profile and this is the critical factor in determining how much real estate remains dry at high tide. Many beaches in the region have very flat profiles. Consequently the higher king tides tides can come right up to the vegetation verge at the top of the beach. These vegetation verges frequently contain mangrove species which are highly salt tolerant. One local tour guide told me that a 3m high tide can even wash into the carparks at Four Mile Beach. Four Mile Beach is very flat right into the treeline. The only way for anybody to get a definitive answer, is to use the high tides during the days before totality as a test to survey your observing site. The tides are a little lower and obviously at different times. NOT FOR NAVIGATION. This program is furnished in the hope that it will be useful, but WITHOUT ANY WARRANTY; without even the implied warranty of merchantability or fitness for a particular purpose. Do not use this program as a basis for any decisions that could result in harm to people, other organisms, or property. Check these predictions against officially sanctioned tables. Agencies like NOAA exist because there is a need for certifiably correct tide predictions. Do not rely on these predictions if you need guaranteed results. There is NO WAY we can get certified data on a zero budget. We rely on users like you to tell us when something is wrong. Please continue to do so. Remember that weather conditions affect tidal ranges and current speeds, sometimes very strongly.